34 years, 9 months, 7 days old age. Faf du Plessis will turn 35 on 13 July, 2019. Only 2 months, 22 days, 22 hours, 5 minutes has left for his next birthday. 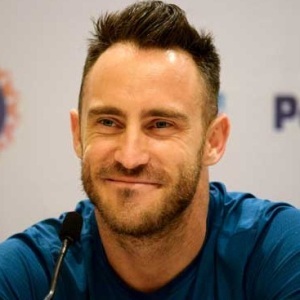 Faf du Plessis has celebrated the total number of 34 birthdays till date. See the analysis by days count and bar graph. Faf du Plessis was born on 13-07-1984 in PretoriaGauteng, South Africa. He is a South African Cricket Player. Composed, Classy and one of the finest crafters of an innings', Faf du Plessis is arguably one of the most consistent South Africa's batsmen post-Jacques Kallis era. He is equally strong on the front foot as well as back foot defence and loves to spend time on the crease and once set can absolutely go berserk. Leading is his natural ability and was, therefore, named the captain of the South Africa T20 side in 2013 and was named the captain of the test side in 2016. Faf du Plessis showed some remarkable maturity and calm in his debut innings against India at Cape Town. After which, he played several crucial knocks for the Proteas and some of his innings have been rated very highly by the cricket experts. Faf is somebody who has received plaudits for keeping a cool head even in tense situations. A quality which the South Africans have mostly lacked in big tournaments. He had a great 2015 World Cup and was among the few bright spots in South Africa's campaign in an otherwise nightmare for them. It was during his leadership that South Africa convincingly beat Australia on their soil in a Test Series in 2015. In IPL, he played for CSk till the franchise banned in 2015. For the next two years, he played for Rising Pune Supergiant. He also played in the CPL and Natwest T-20 leagues as well. Faf is married to Imari Visser since 2013.